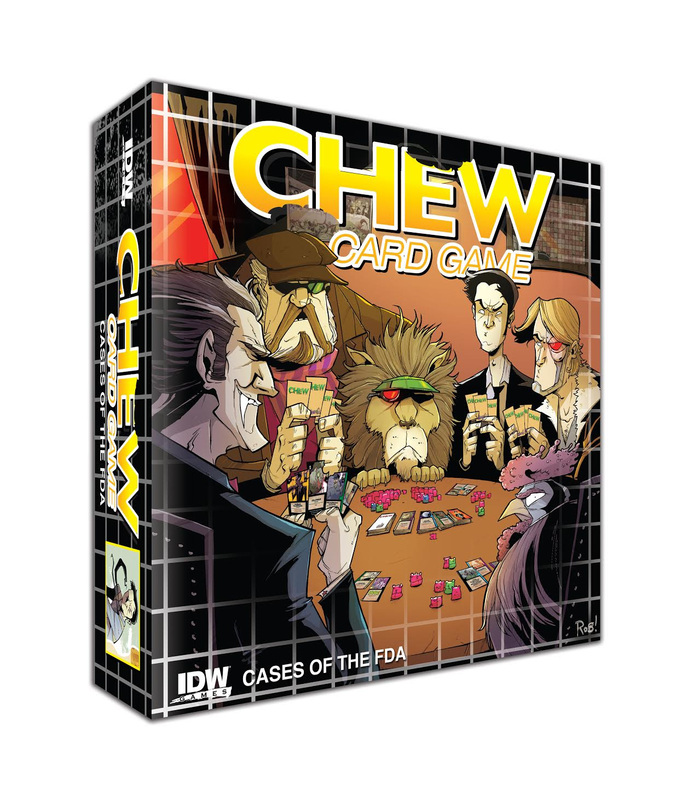 , IDW Games announced the official release date for the first in a series of CHEW tabletop games. CHEW: Cases of the FDA will be available in May of 2015. This fast-paced, high-laughs card game features art by Rob Guillory, including a brand-new box cover, as well as text by CHEWcreator and writer, John Layman. IDW Games tapped designer Kevin Wilson (Descent, X-Files, Arkham Horror) to create an appropriately over-the-top card game worthy of the CHEW name. Head to your Friendly Local Game Store to pre-order CHEW: Cases of the FDA and while you wait for the game to finish baking to perfection, visit http://www.idwgames.com and “like”facebook.com/idwgames and follow @idwgames for more bite-sized teasers.